So really, is our private information (what does private even mean anymore) ever secure? The answer is “probably not.” Every week it seems some company is under attack by hackers. And I must hand it to them, they are pretty good at what they do. 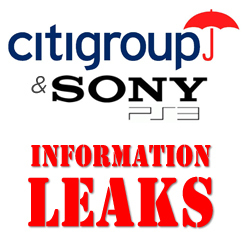 Yesterday it was CitiGroup Inc. that suffered. I often wonder how many people are concerned about their information being stolen. In fact, how many of just sign up for sites and promos with not even a thought that our information could be used by someone else? Fortunately, the CitiGroup hackers did not gain access to social security numbers or birth dates, but they did get contact, email, and account information which might be just as bad. I believe good companies who want to keep their customers happy will not take these events lightly and will do something to reduce their risk exposure. Or at the very least apologize, which Sony did at the E3 conference this week along with the announcement of their new PlayStation Vita.